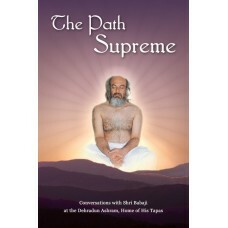 Based on talks with Shri Babaji at the Dehradun Ashram 'The Path Supreme' takes the reader from the basic teachings that Babaji usually covers in public programmes all the way to the very highest teachings of Spirituality. A Self Realized Master is an inexhaustible reservoir of knowledge and inspiration. Having had the fortune to live with Shri Babaji over several years, Babaji's assistant was able to draw from his experience and direct guidance from the Master to collate and edit the transcriptions of Babaji's talks into a sequence of chapters. The book progressively leads the reader from the 'basics' (Part 1) as expounded in public programs, to the 'higher' teachings (Part 2), ending with a deeply inspirational set of aphorisms, known as the Golden Verses, which were recited spontaneously by Babaji during a retreat. The result is a spiritual jewel that is essential reading for all sincere seekers on the Path of sadhana for Self Realization - the Path Supreme.